Welcome to the Autumn edition of County Jottings. Our golfing season is complete and we have had a reasonable year in the Leagues, the 1st Team could only manage 2nd place after a disappointing loss to Hertfordshire at Stoke Park. The Seniors however, not only won the League, but went on to win the Daily Telegraph Trophy at Dunstable Downs beating Hampshire 7-3. The Seniors also won through to the Finals of the Southern Counties Foursomes but lost to Hertfordshire in the Semis. All our teams did well in the EGU County Qualifying events but never threatened the winners and we have a lot of work to do to ensure we perform to our potential. A revised coaching and training programme has been set up to develop our course management, mental and technical skills. Our ‘Club & Coach’ and BB&O Golf Partnership programmes continue to flourish and we have increased our financial input considerably to ensure the success of our new Development Plan for 2010-2013. Our special thanks to all those volunteers who work tirelessly behind the scenes to make this a success. Congratulations to all the winners of our Championship and Trophy Events, also to those who represented the County at Junior, Senior and County levels. David Lane (Goring & Streatley) again won the Scottish Seniors and added the Italian title to his list of achievements. Eddie Pepperell (Drayton Park) is in the England Elite Squad and played in the GB&I winning team against Europe as did Max Smith (Newbury Racecourse) who also represented England at Under 18 level. Max won the Peter McEvoy Trophy and has now been promoted to the England A Squad along with Craig Hinton (The Oxfordshire). Sandy Bolton (Goring & Streatley) represented Scotland in the Boys Internationals and capped his season with a worthy win in our Amateur Championship. Eddie Pepperell also reached the final of the (British) Boys Amateur Championship only to come up against an inspired Tom Lewis at Royal St George’s. Tyrrell Hatton (Harleyford) led England to victory in the Canadian Junior International Challenge in Ontario and took the individual title by 7 shots in his last event as a Junior. Ashley Walton (Frilford Heath) won the main Order of Merit convincingly again with club mate Joe Richardson taking the Junior Order of Merit. 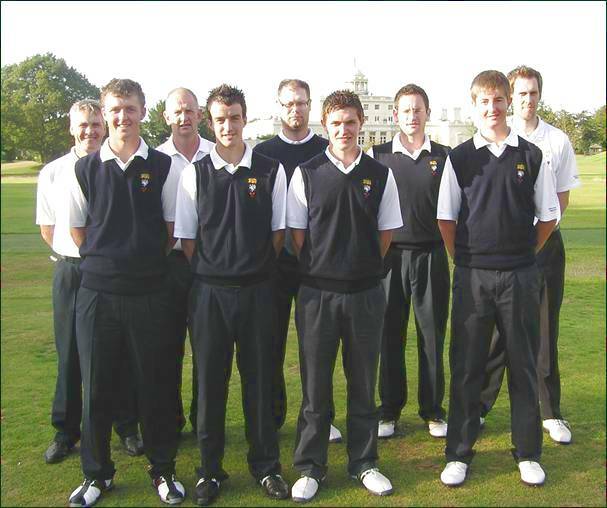 Team at Stoke Park: Steve Barwick (Stoke Park), Sandy Bolton (Goring & Streatley), James Brockington (Henley), Kevin Freeman (Stoke Park), Tom Lawson (Ellesborough), Max Smith (Newbury Racecourse), Nick Woodage (Donnington Grove), Adam Wootton (Oxford City). At Verulam on 17th August we fought back well to defeat Bedfordshire 8½-6½ after a very poor morning but could not make up the ground against Hertfordshire and lost that match 10-5. Team at Verulam: Sam Brass (Castle Royle), Tom Butterworth (Harewood Downs), Alex Bruce (Sand Martins), Alistair Cameron (Beaconsfield), Matteo di Carlofelice (Mentmore), Harvey Coyle (Reading), Daniel Hucker (Beaconsfield), David Walton (Castle Royle), Alex Wills (Harewood Downs), Henry Wilson (Woburn). At Aylesbury Vale on 18th August we played our final matches in the Under 16s League. In a tight match against Bedfordshire we just had the upper hand in both the morning and afternoon games. A single point difference each time gave us the match 7-5. Against Middlesex we shared the honours in the morning, but they outplayed us in the singles winning those 6-2 and taking the match 8-4. Team at Aylesbury Vale: George Abbott (The Oxfordshire), James Butterworth (Harewood Downs), Will Cooper (Woburn), James Foster (Newbury & Crookham), Jordan Mann (Sand Martins), George Munsey (Frilford Heath), Dean Newbold (Frilford Heath), Joe Richardson (Frilford Heath), Josh Stanners (Hazlemere), Sam Williams (Castle Royle). Surrey beat us 9-6 in this annual match kindly sponsored by the MUGS. The boys all enjoyed the day at West Hill and were given a gift by the MUGS to commemorate the day. Team at West Hill: George Abbott (Chiltern Forest), Ben Beach (Burnham Beeches), James Butterworth (Harewood Downs), Jake Canning (Stoke Park), Matteo di Carlofelice (Mentmore), Will Cooper (Woburn), James Foster (Newbury & Crookham), Jordan Garnish (The Oxfordshire), Joe Richardson (Frilford Heath), Josh Stanners (Hazlemere). After not playing a number of matches due to the opposition cancelling, it was good to finish on a winning note when we played Wellington College on 10th October at East Berkshire. Having been beaten in the away fixture in February we turned the tables on the College winning 5-3. The College fielded 2 outstanding Girl students and no doubt, the 2 boys who lost to them, got some ribbing! Team at East Berkshire: George Abbott (The Oxfordshire), Adam Batty (Hazlemere), James Butterworth (Harewood Downs), Will Cooper (Woburn), Jordan Garnish (The Oxfordshire), Josh Stanners (Hazlemere), Alex Stubbs (The Oxfordshire), Scott Webster (Henley). Our 3rd match of the season and we were off to The Berkshire again on 17th August. Not a happy hunting ground for us, but a severe threat from the County Secretary, informing the team of his skills with Photoshop had the desired effect. Bedfordshire were not in with a chance after this pep talk and despite a wobble in the middle (typical of all Seniors) we took the match 6½-3½. 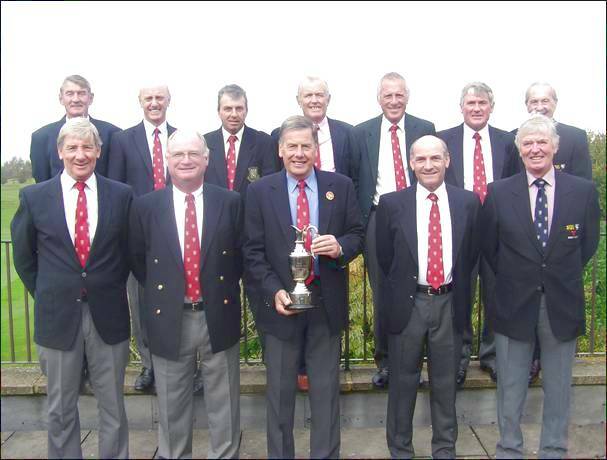 Team at The Berkshire: Derek Bell (Newbury & Crookham), Bob Clarke (Mentmore), David Doodson (Temple), Adrian Donkersley (Gerrards Cross), Duncan Forbes (Sonning), Robert Gill (Gerrards Cross), Graham Hart (Frilford Heath), Gilbert Runnicles (Gerrards Cross), John Summers (Frilford Heath), Jim Wilson (Frilford Heath). You should see the doctored version! On 21st August it was our turn to host this event this year and we went to Goring & Streatley to test the stamina of some of the finest Senior athletes in the South East. After a tense semi final against Surrey we prevailed (after the most peculiar tie break system ever devised) and went on to play Hampshire in the Final. Our outstanding fitness enabled us to keep ahead in all our games and we came home 4-1 winners. 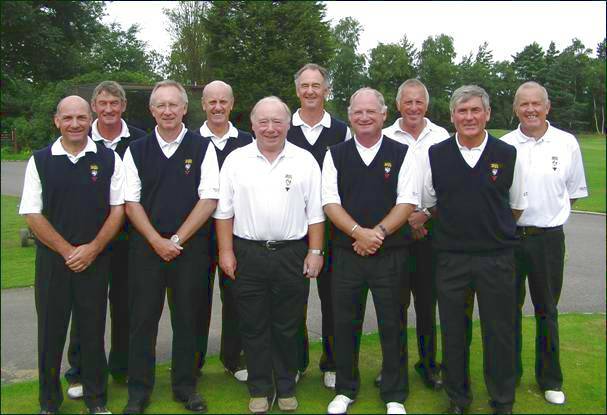 Team at Goring & Streatley: Derek Bell (Newbury & Crookham), Rod Crisp (Ellesborough), David Doodson (Temple), Adrian Donkersley (Gerrards Cross), Duncan Forbes (Sonning), Robert Gill (Gerrards Cross), Graham Hart (Frilford Heath), Gilbert Runnicles (Gerrards Cross), John Summers (Frilford Heath), Jim Wilson (Frilford Heath). Getting them to stand facing the sun for the photo was a good wheeze! In our last match of the season, at Ellesborough on 1st September, we needed just 3 game points to win the League. Wanting to keep our unbeaten record was the order of the day and despite losing 2 games we had banked on, the rest of the team performed well, and some convincing wins took us home 6-4 and top the South East North of the Thames League. We now go on to play Hampshire, winners of the South, in the final. 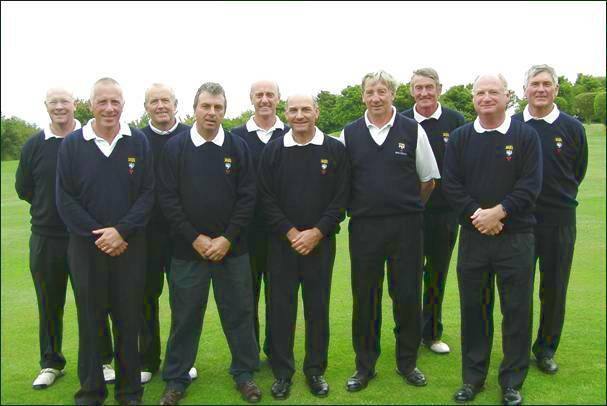 Team at Ellesborough: Bob Clarke (Mentmore), Rod Crisp (Ellesborough), Adrian Donkersley (Gerrards Cross), Robert Gill (Gerrards Cross), Neil Franklin (Beaconsfield), Graham Hart (Frilford Heath), Cliff Pearce (Flackwell Heath), Gilbert Runnicles (Gerrards Cross), John Summers (Frilford Heath), Jim Wilson (Frilford Heath). Due to torrential rain at Oxford City on 17th July, this event was rescheduled for 15th August and kindly hosted by Denham. Due to the difficulty of arranging another 36 hole competition with 24 teams of three, it was decided to make the qualifying event an 18 hole medal with two players and both scores counting. This did favour the stronger Clubs and it was no surprise when the Stoke Park team of Kevin Freeman and Steve Barwick came home in level par 140 scoring 72 and 68 respectively. The Flackwell Heath pair of Ian Jackson and Paul Lewington did very well scoring 145 to finish 2nd and Tadmarton Heath’s Spencer Hallam and Liam Robinson finish 3rd. 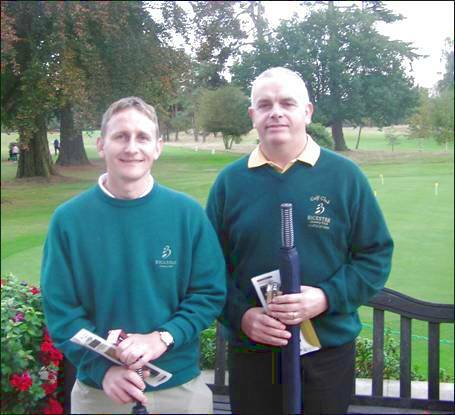 The BB & O Autumn Trophy was played at Henley Golf Club on Friday 18th September 2009. We had a good entry of 60 for the final Order of Merit event, once again, consisting mainly of players of 5 handicap and below. Ashley Walton (Frilford Heath) had already secured the OOM title as his nearest rivals were well off the pace. 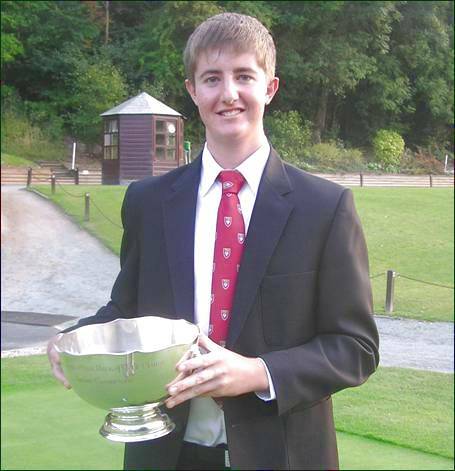 Sandy Bolton was also assured of 2nd place after his win in the Amateur Championship at Burnham Beeches. The morning scoring was very good, on a gorgeous day, with Christy Whelehan (West Berkshire) leading after a fine round of 68 – 2 under par. Next best was Sam Whitehead (Woburn) on level par with 4 others on 71 and three more players on 72 including local favourite James Brockington. There were altogether 25 players on 75 and below in what one was one of the best morning’s golf at a Championship for quite some time – well – since last year actually! The afternoon scoring was not as good despite the fine weather and a number of the early leaders could not repeat their morning’s efforts. Defending Champion Nick Hills (Donnington Grove) set the early pace after adding a lever par 70 to his morning 72 but was quickly overtaken by James Brockington who had produced a 3 under par 67 to finish on 139 a total of 1 under par. Out on the course Jon Carter (Reading) was playing inspired golf and had reached the turn in just 30 shots and was also 1 under for the day. Unfortunately, he was not able to keep up that standard and despite a fighting finish he would fall short of Brockington’s target who was a worthy winner of a highly competitive Championship. With Carter and Hills taking the 2nd & 3rd prizes in the Scratch event, the leading Handicap prize went to Asa Phillips after an excellent afternoon net 68 was added to his morning 70. with David Swift (Maidenhead Artisans) in 2nd place. 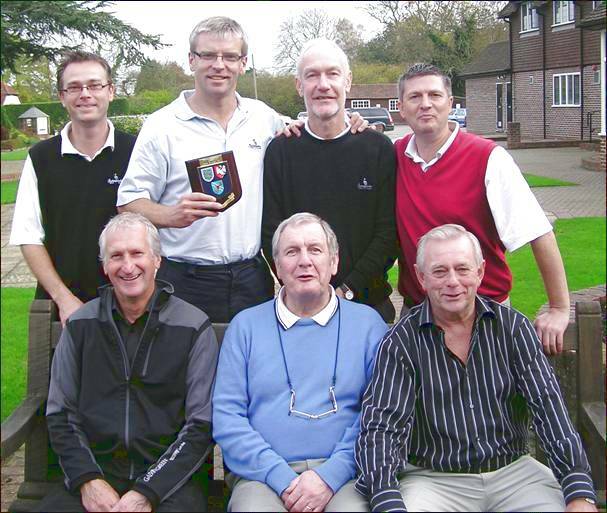 The BB & O Boys 14 years and Under Championship was played at Maidenhead Golf Club on Monday 26th October. There was a good entry of 30 boys with handicaps of 20 or less for this Championship which has been changed to an 18 hole competition. This enables us to start later in the morning and avoid the possibility of a frost delay or bad light. Once again we had a dry day, mild and quite sunny. Most of the Boys found scoring difficult with the course playing quite long and there were plenty of nerves around as a lot of the lads had not played in a County event before. The early leaders were Jake Dines (Hinksey Heights) and just behind him was Alistair Cameron (Beaconsfield). Out on the course, pre tournament favourite, Will Cooper (Woburn), was making up ground after a poor start. He had recovered his game and was grinding out a score with a series of pars. With a few holes to play it was clear it was only his to lose and he rose to the occasion with a very solid run home. His score of 71 just one over par, was the lowest score recorded in the 12 years of the Championship. In the handicap prize section Adam Dewji (Woburn) looked assured of victory after an excellent net 64 but he was outshone at the very last moment when Max Nicholls (Newbury & Crookham) produced an amazing 78 net 62 to take the prize and also finish 4th in the Championship proper. 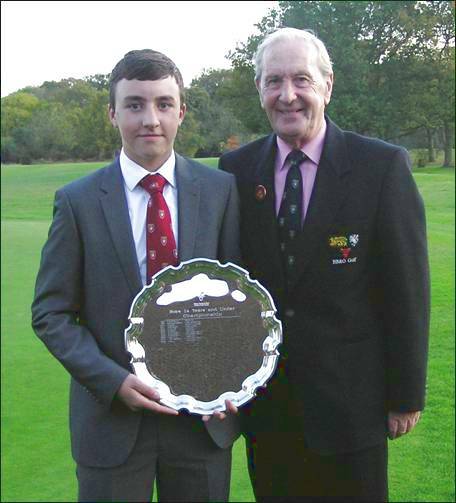 Will Cooper (Woburn) receives the Salver from Iain MacCaskill (President). The 15th Final of the Hillman Trophy Plate between West Berkshire and Buckinghamshire took place at Sonning on Saturday 31st October. Play is over 18 holes singles matchplay for a seven man team, with each team having three players in handicap range 6 to 9 and four with a handicap of 10 and over up to a maximum of 20. Both teams were in the Final for the 1st time. West Berkshire prevailed 4-3 after getting off to a great start by winning the first 3 games. Despite a good fight back from the Buckinghamshire tail it was too little too late and the West Berkshire Captain, Charles Dixon, had the honour of winning his game to take the Trophy for the first time. Everyone was very grateful for the warm hospitality given to us by the host club and for the fine condition of the course. 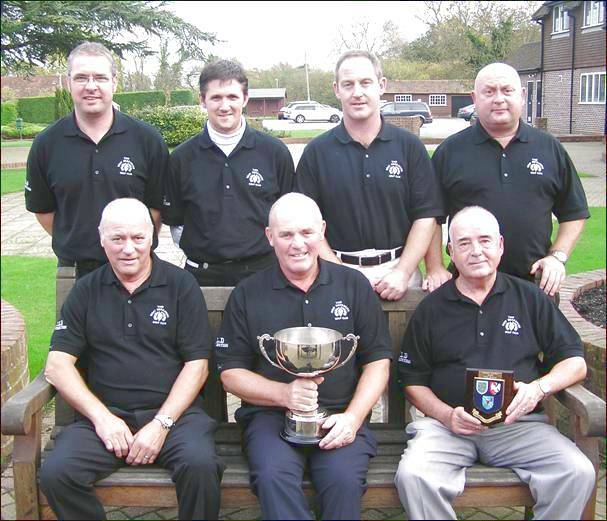 Buckinghamshire: Stu Bean, John Catherall, Pat Carroll, Barry Lavers (Captain), John Lutterell, John Spendley, Trevor Webb. 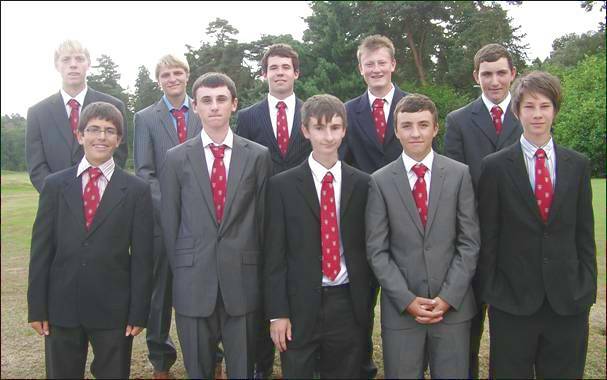 The 18th Final of the Hillman Trophy took place at Frilford Heath over the Green Course on Saturday 10th October. Play is over 18 holes singles matchplay for a seven man team, with each team having three players in handicap range 6 to 9 and four with a handicap of 10 and over up to a maximum of 20. 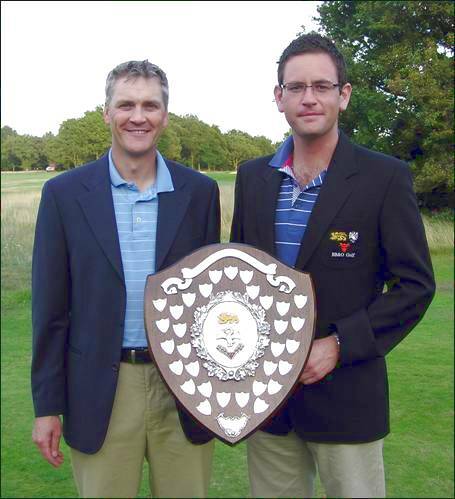 Calcot Park had previously won this Trophy in 2002 but it was new experience for Studley Wood. Things got off to an amazing start as the 1st player for Studley Wood had thought the start time was an hour later than published. With seconds to go before he was disqualified he ran on to the tee and boomed a drive straight down the middle. So much for warming up and preparation! Crucially this would prove to be the defining game in the match. Disqualification and the last 2 games would have been played out – probably ending in a tie. As it was Studley Wood won the first game and the Calcot Park team struggled to hold on. 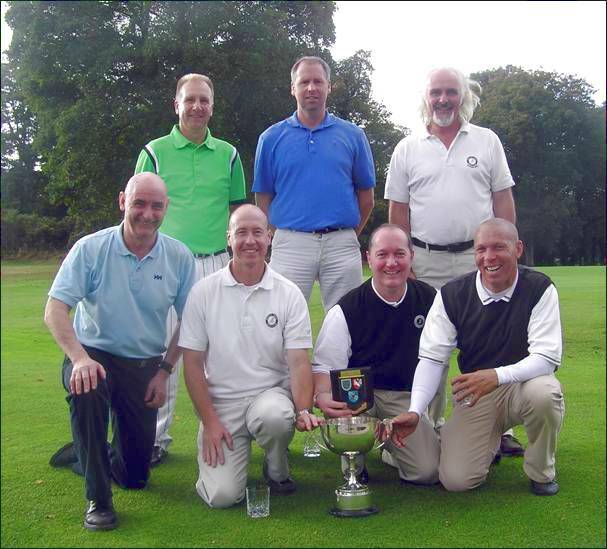 The vital point for Studley Wood came on the 17th green in game 5 and they secured their first win in the Championship. A wonderful final played in the best of spirit and congratulations to all the players for their performance over the season. Everyone was very grateful for the warm hospitality given to us by the host club and for the fine condition of the course. Studley Wood: Barry Darby, Pat Clavent, David Dust (Captain), Mark Darnell, Alban Dynoe, Tim Jones, Andy Sutton. Calcot Park: Ron Grinham, Mark Guest, Mark Osborne, Kevin Payne, Ian Pellow, Simon Powell, Mark Syrad Captain), Charlie Trayhorn. 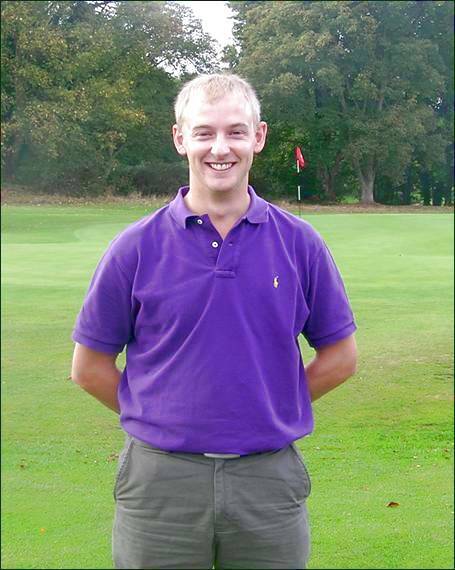 Ashley Walton (Frilford Heath) won the OOM by a massive 30½ points from Sandy Bolton (Goring & Streatley) who had also had an excellent year by winning the County Championship. Ashley won the Frilford Heath Gold Medal, the Burnham Beeches Open, The Mid Age Championship, was second at the Oppenheimer and joint second in the Beaumont Pease and second to Sandy in the County Championships. A pretty good year by anyone’s standards. 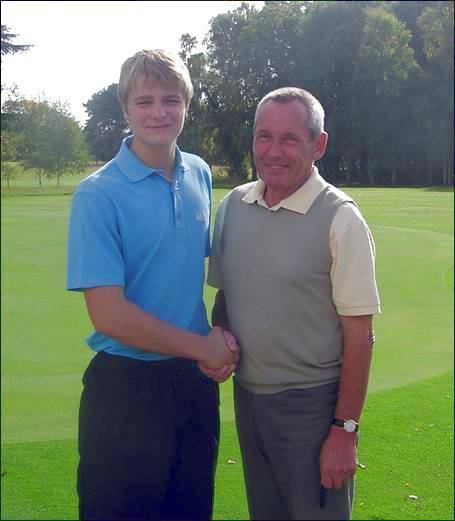 Joe Richardson (Frilford Heath) jus pipped Jordan Mann (Sand Martins) to win the Junior Order of Merit Trophy. He had a very steady year culminating in his win at the Beaconsfield Junior Open. Played at Thetford on Wednesday 26th & Thursday 27th August. Our Team of 7 players were: Sandy Bolton (Goring & Streatley), James Brockington (Henley), Jake Canning (Stoke Park), Dean Newbold (Frilford Heath), Josh Stanners (Hazlemere), Ashley Watkins (Burnham Beeches), Luke Williams (Frilford Heath). The format is to play 2 foursomes games both morning and afternoon. Counties are allowed to play any 6 of the 7 players throughout the Championship. With 11 Counties in the English Golf Union South Eastern Group 2 must drop out each year to allow the event to be completed in two days. After last year’s great win we were in a positive mood and felt we had a good chance of challenging for the title again. 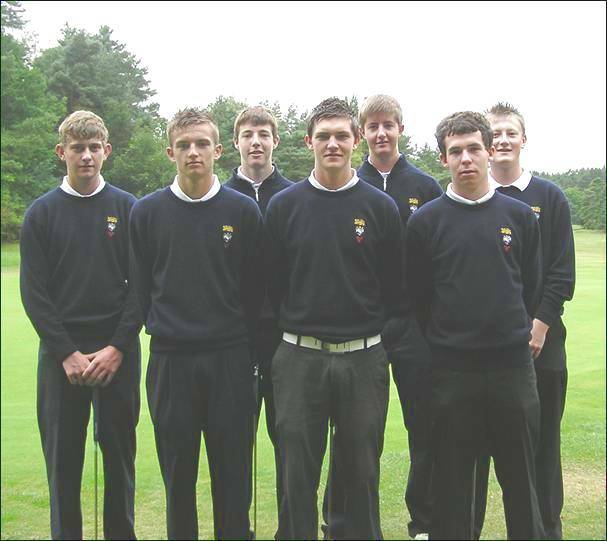 We had a strong side with Josh Stanners having just won the Faldo Series at Brockett Hall, Sandy Bolton had been picked for Scotland in the Boys Home Internationals and had just won the BB&O Amateur Championship. Luke Williams was the current BB&O Junior Champion and James Brockington had made an impressive start in his County 1st Team debut. We got off to an average start on the first morning with a win against Norfolk but suffered a loss to Sussex. At this point we were not too worried as we felt there were better things to come. The afternoon was very poor. We were always going to struggle against the strong Surrey side and went down 2-1, but we expected to beat Bedfordshire and ended up losing ½-2½ We now had no hope of retaining our title but were optimistic of a mid table finish. Thursday morning was more of the same and we were comprehensively beaten by Kent and just managed a half with Suffolk. We were now lying in the relegation zone and as we were playing Hampshire and Hertfordshire, both of whom were vying for the Title, our chances looked slim. We managed just ½ point from the first 2 games and with the final pair in trouble off the tee it was odds on we would be relegated. A recovery from the trees left James Brockington some 50 yards short of the 18th green and to everyone’s amazement holed his wedge shot to sneak a win against the Hertfordshire boys and the all important point needed to avoid the drop. We edged Bedfordshire out on ‘goal difference’ and were extremely lucky to get away with it. The League final was played a Dunstable Downs on 15th October against Hampshire. We got off to a terrific start and won the first 5 games with Gilbert Runnicles, David Lane and John Summers all making birdie 2s to win their games 1 up. These very close games all went our way and if they had been 3 halves then things could have been a lot different. Rod Crisp had the honour of getting the match winning point and with the Trophy assured the last two games settled for a half and we took the match 7-3. 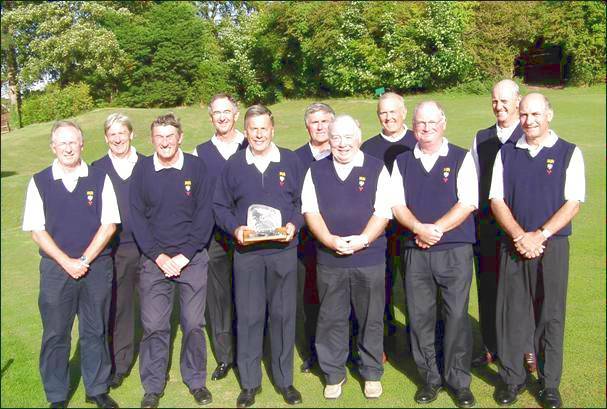 Team at Dunstable Downs: Bob Clarke (Mentmore), Rod Crisp (Ellesborough), Adrian Donkersley (Gerrards Cross), Robert Gill (Gerrards Cross), Graham Hart (Frilford Heath), David Lane (Goring & Streatley), Cliff Pearce (Flackwell Heath), Gilbert Runnicles (Gerrards Cross), John Summers (Frilford Heath), Jim Wilson (Frilford Heath). 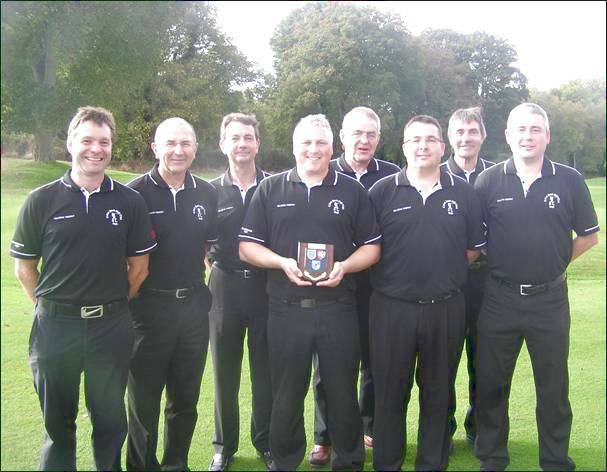 The unbeaten team then went to Orchardleigh in Somerset to contest the Finals of the Southern Counties Foursomes on 20th October. The other group finalists were Hertfordshire, Gloucestershire and Suffolk and given the luck of the draw, we met Hertfordshire in the first semi final in the morning. Traditionally our closest rivals in the North of the Thames League, Hertfordshire seemed to cope with the dank and gloomy conditions on a long golf course better than us. We always felt that this match would determine the winners of the Final and so it proved as we struggled to find any form in the last 3 games. Realistically we never looked like wining despite taking 1½ points from the first games and in the end lost 1½-3½. On a rainy afternoon we beat Suffolk for 3rd place and Hertfordshire were worthy winners after beating Gloucestershire 3-2. A turnout of over 50 attended the Half Year Council Meeting on 13th March. Iain MacCaskill highlighted the achievements of the year and the County Secretary/Treasurer outlined the changes to the handicap system with the introduction of the Central Handicap Database. After the meeting the delegates enjoyed the hospitality of Frilford Heath and played the Green Course on a beautiful Autumn day with Jamie Herbert and Mick Osborn from Bicester winning first prize in the Greensomes event. 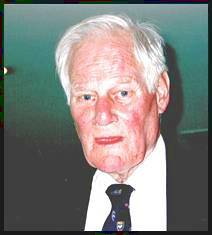 We lost another good friend in BB&O this year when Rex Hepburn (Newbury & Crookham) died on 21st September. Rex was a Life Vice President of the County Union and will be best remembered for his outstanding work with our Juniors. His teaching background enabled him to command a great deal of respect, and I suspect a little fear, as he coaxed the best out of his lads. Rex was also instrumental in starting the Douglas Johns Trophy, a tournament that has gone from strength to strength and is producing a whole crop of outstanding winners who will, no doubt, go on to even greater achievements in the Professional game.